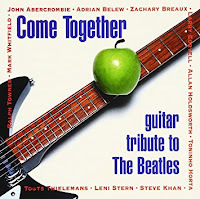 You don't have to be a Beatles fan to dig this guitar tribute to The Beatles. This CD has jazz guitarists recording Beatles covers. Fans of the late Allan Holdsworth will want to check it out as his cover of Michelle does not appear on any of his albums. The man behind this 1993 CD is veteran pianist, vibraphonist, session musician and producer Mike Mainieri and he released it on his own NYC label. Jazz fans will know Mainieri as leader of Steps Ahead, a group he has led since 1980. Back in the 60s, he introduced the electric vibraphone when he was in Buddy Rich's band. He first recorded as a leader in the late 60s and got more into production and session work in the 70s. But Mainieri has continued to play New York clubs and lead Steps Ahead. He started NYC Records in the early 90s. And in 1993 he released Come Together: Guitar Tribute To The Beatles. By this time, Holdsworth lived in San Diego and he owned his own recording studio. Musicians on Michelle include Holdsworth's long time collaborator Gordon Beck on piano, Gary Willis on bass and Kirk Covington on drums. Both guys are from Scott Henderson's Tribal Tech. Other guitarists on this album are Mark Whitfield, Toninho Horta, Ralph Towner, Steve Khan, Zachary Breaux, Adrian Belew, John Abercrombie, Leni Stern, Larry Coryell and Toots Thielemans on guitar and harmonica. These Beatles covers were recorded for this album so you won't find them anywhere else. And it's available as a budget CD. This album did so well that Mainieri released a second CD of Beatles covers with a completely different lineup of guitarists. Jazz guitar fans should check out both albums. Here's a video of Michelle by Allan Holdsworth.